Happy Tuesday!! You might remember seeing this outfit on my Instagram last week. I feel like I’ve been wearing pink a lot lately (you’ve probably noticed ;), but I love the soft, pretty blue color of these espadrilles! I decided to pair them with a matching blue tote and an all-white outfit to switch things up! I’m really loving the platform wedge trend right now so I’ve linked more super cute options from Nordstrom below. 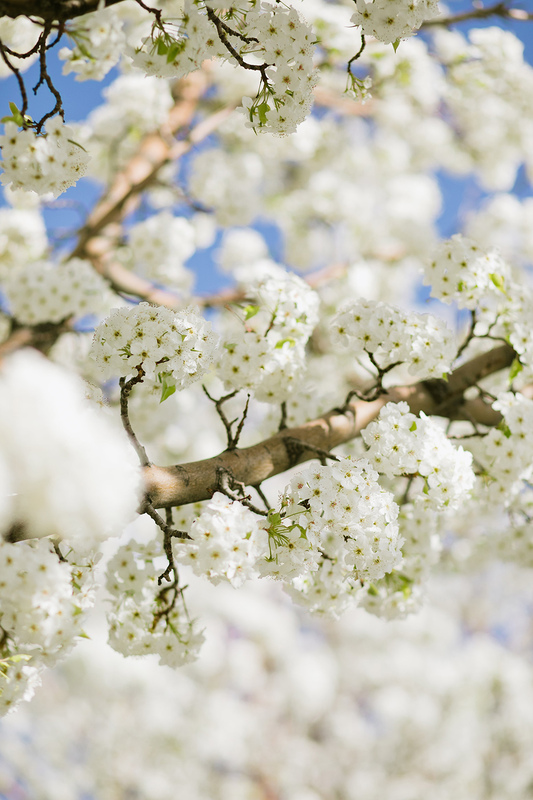 And can we talk about how gorgeous these blossoms are?! Spring has definitely sprung around here! Your white flutter top is so cute and I love it with the blue espadrilles wedge! That’s such a stunning outfit! All white with a pop of blue, so beautiful. Beautiful all white outfit! 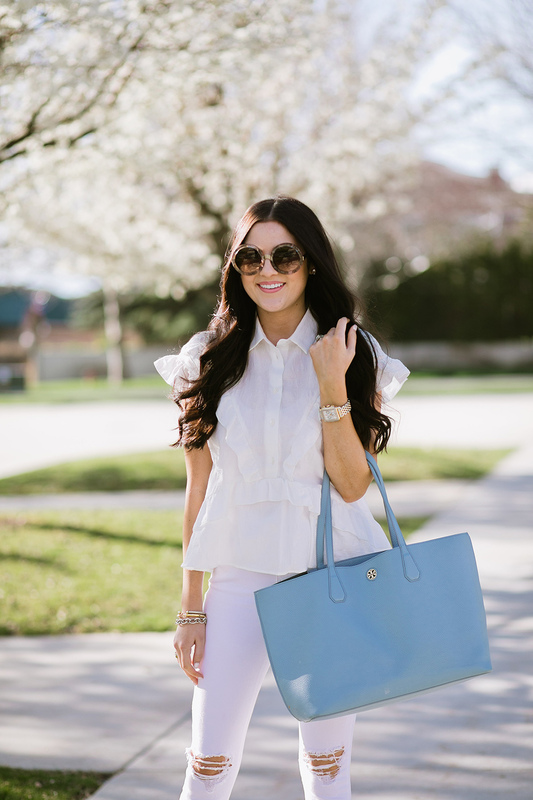 Your top and bag are such a great pieces! Those espadrille wedges are so cute! Love the combination of whites in this look! I love the dusty blue color! 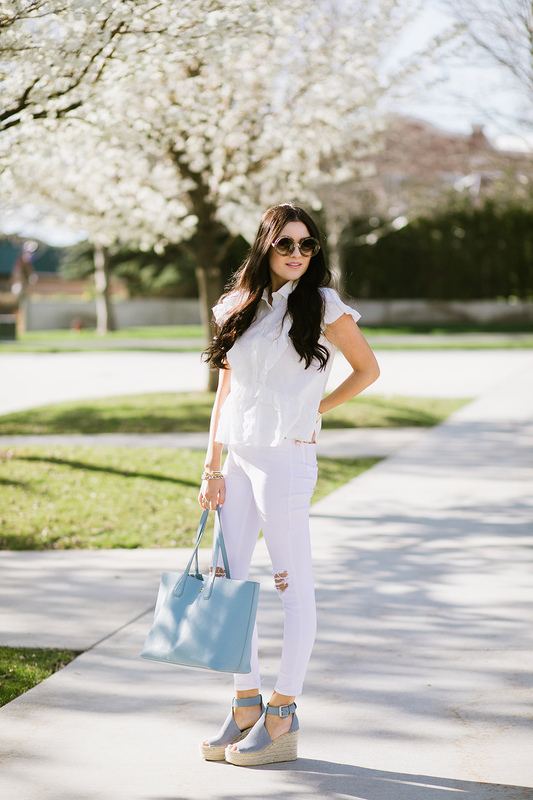 I love the pops of blue against the all white, it looks so refreshing and perfect for spring! Those espadrilles look so comfy, too! Thanks for sharing and I hope you’re having a great day so far! I’m loving platform espadrilles right now as well and those blue ones are so pretty!! The color is stunning! Those shoes are gorgeous! I need them in my life! Super jealous of how beautiful your tress are right now! It’s still barren around Minnesota! Anyway, adorable outfit – love the white on white! OMG LOVE LOVE LOVE!! What beautiful trees! :) Great post! so cute! I love the hint blue! I love the ruffles on that top! And those cute blue shoes!! 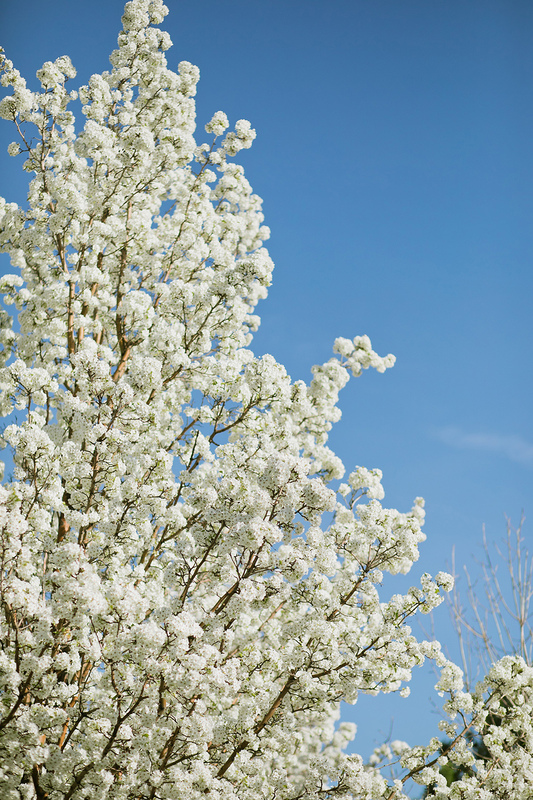 Gorgeous pics of the white blooms too. I’ve been seeing those shoes literally everywhere, so in love! Gorgeous gorgeous wedges, really need some like these!! Love the all white with a touch of blue! I love the sleeves of your top, SO pretty!